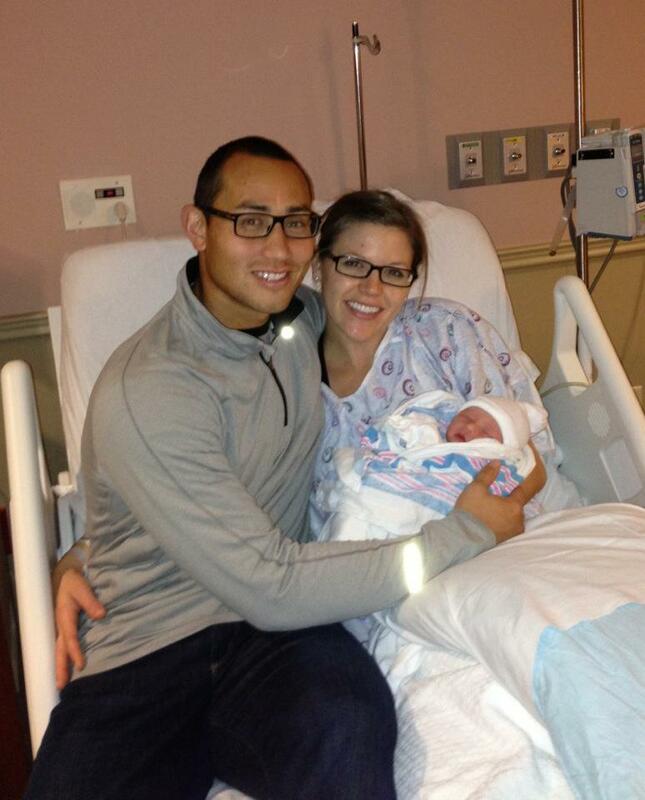 Baby Robles has arrived! Which means I have transformed from a normal human being to a milk factory. And if we have more nights like last night, I may turn into a zombie as well. To help with my lack of time in the kitchen I have recruited my sister to take over Recipe of the Week for a bit. To be honest, she's the real chef in the fam so get excited cause you're in for some awesome deliciousness with a side of great entertainment cause she's funny too. Sorry boys, she's off the market! And she was one gorgeous bride. With that being said, I will turn over this post to the wonderful, beautiful aunt of this sweet, precious little guy who I am going to go stare at for a bit because I am slightly obsessed with his adorableness. Thanks Riss for helping me out! This week our family welcomed this little guy into the family. My sister looks way too good to have just had a baby. She is pretty much incredible and their new family unit is absolutely adorable. We are all smitten with this little guy right now and can't get enough pictures and videos of him!! With Cara being on the other side of the country I miss sister time like this but in less than 4 days I will be on a flight to see her, Luis, and Eli. So, as Cara is recuperating and enjoying her time with little Eli I get a chance to blog in her absence. This week my in-laws were in town for a quick trip. My mother-in-law is known for her amazing apple sauce. This woman can take 180 lbs of apples and turn them into sauce in no time. Before Zach and I got married he made me promise to learn how to make apple sauce from his mom and this week I became a Certified Plumb Wife. 1. First and foremost loving God, but just beneath that is loving Ohio State football. Go Buckeyes! 2. Casseroles for your man must be a staple in your food repertoire. - half check, I am slowly transitioning from making girl food to making man food. For some reason my husband does not think cookie dough or salad suffice as a meal...weird. 3. Another important part of the Plumb Wife Certification Test, knowing and mastering the art of making applesauce. -As of this week, check. Why do I tell you this? Because now you too are going to become an applesauce making whiz. I learned from the master herself and I am passing along the knowledge to you just in time for Fall and apple sales at the grocery store. I used to think making applesauce would be a hard process but in reality it is actually enjoyable! Even more so when you are doing it with someone else. It is especially fun if you have one of these food mills. Get one of those and you don't have to peel or core your apples before making the sauce. Yes, they are worth the money. You can even find them on Ebay for $20-$30. It takes about 2 lbs of apples for every quart of apple sauce. It is a good thing mason jars are so popular right now because you can easily find the jars you need at an incredible cheap price. So now that you have no excuses to not make your own applesauce deliciousness, let's get started! Start by cutting up your apples into 6 or 8 slices. You can use an apple slicer or a knife, options in life are always nice. Put those slices into the biggest pot you have but only fill it to just below the top, you need room to stir all that deliciousness. Fill your pot about 2/3-3/4 full. If you fill it up too full you will have to drain some water before you mill your apples otherwise you will have watery apple sauce. Put a lid on your apples and water and heat them over medium-high heat, stirring occasionally. We used a mix of Gala and Granny Gmith apples. The Grannys cook up better but the Gala are sweeter and require less sugar. When your apples start to get really soft and a little mushy they are done and you can take them off the heat. You are also going to need a canner if you want to store these in your cupboards. If you can your jars of sauce they will last you for years....literally. If you don't have a canner you can just put your sauce in tupperware and freeze it. My brother-in-law, Isaac, actually prefers his apple sauce like this. So if you have a canner fill it a little over half full with water and put it on your stove on medium high heat, you need that water good and hot! Get your jar lids and put them in a sauce pan with water just covering the tops. Let this simmer on the stove. Get your mill set up according to its instructions and get ready for a bit of a mess. Set up a bowl to catch the peels, and seeds. Also have a big bowl or pan ready to catch your apple sauce!! Pour your whole pot of apples and water in the top and start churning away! If you notice your sauce is a little too thick, add a some water. If it is too thin drain some water off your apples. After you get your sauce, add sugar to taste and cinnamon if you feel compelled. This is your apple sauce, make it how you love it! At this point you can be like me and eat the warm apple sauce because it is AMAZING! Some warm apple sauce on toasted bread is the way to go. After you have the taste and consistency you want, fill your jars just shy of where the threading starts, below where the top curve the threading. Put your lids on top and fill your canner. We had a really big one so we could fit up to 7 if we wanted. Fill your canner up with water so your jars are completely covered. Put the lid on your canner and wait for it to get to a rolling boil. Once it gets to a rolling boil set the timer for 25 minutes. When you pull the jars out of the canner they're going to be hot and potentially slippery. If you see separation at the bottom of your jar it is ok that is normal! Um hi, hello, you now have applesauce! Wait until all your lids are fully sealed. Resist the urge to move them or touch them! 12 quarts! With how my husband eats this stuff this will last me a couple days.... ok you're right maybe more like a few months. Enjoy making your apple sauce, it is the perfect fall activity! It put me in the mood for the season despite our 80 degree tank top and shorts weather here in San Diego. *If you don't have a canner or a food mill it is ok! You can still have great homemade applesauce! Just read the note at the bottom of the recipe. Start by cutting up your apples into 6 or 8 slices. Put those slices into the biggest pot you have but only fill it to just below the top, you need room to stir. Fill your pot about 2/3-3/4 full with water. If you fill it up too full you will have to drain some water before you mill your apples otherwise you will have watery apple sauce. Put a lid on your apples and water and heat them over medium high heat stirring occasionally. When your apples start to get really soft and a little mushy they are done and you can take them off the heat. Fill your canner a little over half full with water and put it on your stove on medium high heat, you need that water good and hot! Get your jar lids and put them in a sauce pan with water just covering the tops. Let this simmer on the stove. Get your mill set up according to its instructions and get ready for a bit of a mess. Set up a bowl to catch the peels, and seeds. Also have a big bowl or pan ready to catch your apple sauce. Pour your pot of apples , water and all in the top of your mill and start churning away! If you notice your sauce is a little to thick add a some water. If it is too thin drain some water off your apples. After you get your sauce add sugar to taste and cinnamon if you feel compelled. This is your apple sauce make it how you love it! After you have the taste and consistency you want, fill your jars just shy of where the threading starts, below where the top curve the threading. Put your lids on your jars as tightly as you can and fill your canner. Fill your canner up with water so your jars are completely covered. Put the lid on your canner and wait for it to get to a rolling boil. Once it gets to a rolling boil set the timer for 25 minutes. When the 25 minutes are up carefully take the jars out with a jar lifter. They are going to be really hot! Once you get them out resist the urge to touch them. Wait until you hear them all pop. The lid should be sealed like a jar you buy from a store. This may not happen right away. Wait a day and if they still haven't sealed that is ok just put the unsealed jars in the fridge if you want to eat them right away or in the freezer if you want to wait. If they sealed successfully you can store them for several years. * No canner: Pour your applesauce into your jars or tupperware and freeze. No food mill: Peel and core your apples before you boil them. You two make me wish I had a younger sister too :). Love to you both. 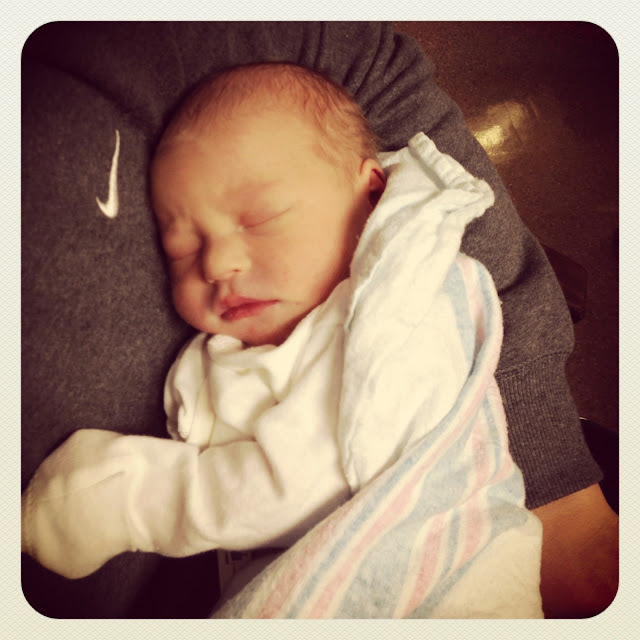 First off, congrats Cara and Luis on your beautiful baby boy! How exciting and wonderful. He is just perfect.